This week has flown by. I suddenly realised this morning that it was Friday and I had a blog post to write. At that point I had a bit of a panic. What have I got to tell you about? It's been one of those weeks where there's been lots going on but not necessarily things that you would find interesting. So, I had a look at my blog list and discovered that an exciting publication is out. A while back I blogged about providing LED lights for Orsi Skulteti for her recreation of 221b Baker Street from the Sherlock BBC TV series. (Using LED Lights in a kitchen) A while ago she contacted me to tell me she had been asked to write asn article about the making of her kitchen for the Spanish magazine "Miniaturas" and she asked if it would be ok to specify me as a supplier. I quickly agreed. According to her blog the magazine has now been published so if anyone gets the magazine you can look out for the article. 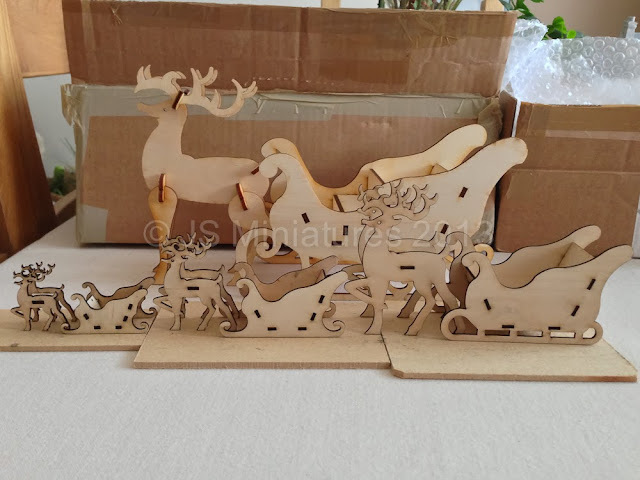 Other than that I've been busy with orders and I have been preparing the sleighs and reindeer for Kirsten Miller or Quernus Crafts. It looks like a small army! Here they all are, glued up ready for painting. The first coats of paint are on so I'm hoping to have these finished soon. I am planning to have these available for sale and also as a workshop at the brand new Wonders In Miniature online fair in November. The fair will run from the 8th - 11th November and is all about holidays from around the world. Keep a look out for updates soon! Hot off the laser cutter I am very excited to announce the arrival of my Christmas products for 2013. 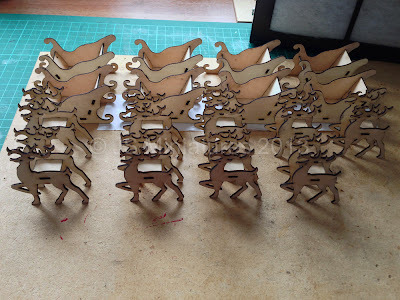 Last year you may have seen or bought my big sleigh and Rudolph models. 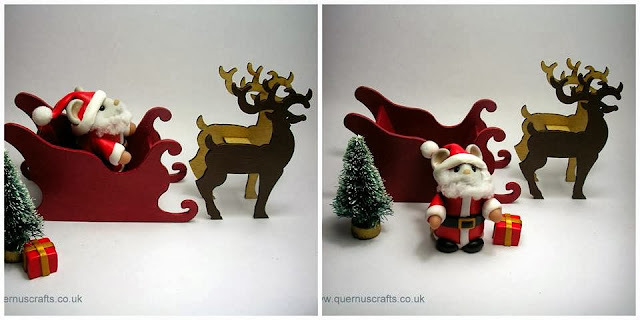 This year I have expanded this range and now have 3 smaller sets so you can buy one for 1/48th, 1/24th or 1/12th scale or they can just be a lovely ornament as part of your Christmas decorations. The photo shows them just unpacked and assembled straight out of the box! I am also very excited to be working with the very talented Kirsten from Quernus Crafts on a collaboration for Christmas. 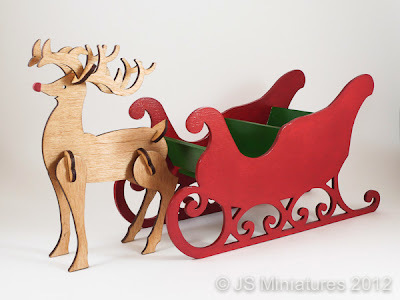 The 3" kit has been specially designed for a very special Santa! Meet Santa mouse who is all ready to deliver his presents for Christmas. This was the prototype design so the keen eyed amongst you will notice that the reindeer now have 4 legs! These sets will be available from Kirsten at the Country Living fairs in Glasgow and Harrogate at the end of November and also through her website leading up to Christmas. Now the kits have arrived I just have to get 8 of them made up and painted for her. Busy days ahead! I'm still finalising the packaging but if you are interested in pre-ordering a kit then please comment or send me an e-mail. I can also paint them for you. Please inquire for costs. Following on from my tutorial last week about installing LED spotlights in a room box I have now added 3 new spotlight kits to my website to make it very easy for you to have a go! 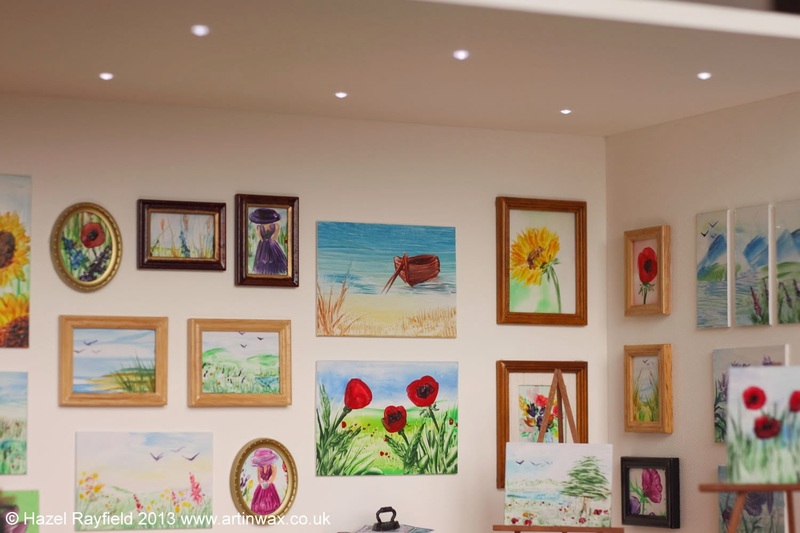 These include a kit for a shop window or frontage with 2 LEDs, holders and battery kit, a 6 LED kit for a standard room box and a 10 LED kit for a large room box. 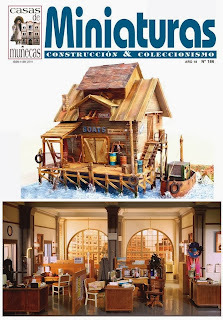 They are also suitable for a dolls house 1/12th scale room. 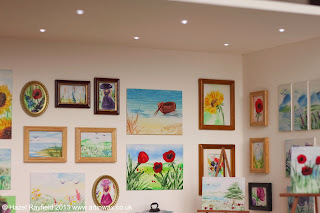 I have also updated my customer gallery. If you are looking for inspiration it's well worth a look. This week I added a photo from Barbara Adair who has bought several of my pre-wired flexible LED strips to light her shop boxes. Here is her Scent Shop room box lit with 6 LED bright white strips. They are nice and bright and a very affordable option. All run off a 12v supply, usually a 12v regulated transformer. They can be powered by a 9v battery but they are dimmer and the more strips you add the quicker the battery will run down. Another new section I have added to my website this week is for power supplies / transformers. I have a regulated plug in transformer that will power from 1 to 50 LEDs and the voltage is adjustable so you can set it for use with 3v, 6v, 9v or 12v. You can only use it on one voltage at a time but it does allow a bit of flexibility if you would rather use mains power rather than a battery to light your miniatures. These are the modern type of digital transformer so they're small in size, efficient and quiet making it a good choice for your lighting. They are also regulated meaning the power output won't spike making them perfect for powering delicate electronics like LEDs. 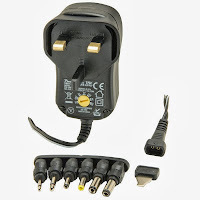 It comes with a selection of plugs, but for use with my LEDs you can purchase a 2.1mm socket to terminal block connector so you can fix the wires from the LEDs in one end and then simply plug it into the transformer plug. Simples! Finally, I am hard at work on my christmas range and hope to have pictures and final details very soon. Watch this space!